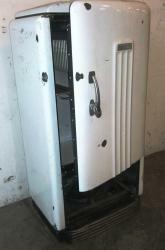 This 1938 General Electric was the oldest refrigerator recycled in PPL Electric Utilities' service territory. By the time Mike Ansel acquired his old refrigerator from a family member in 1974, it had already been on the job since Franklin D. Roosevelt was president. At the time, he knew it was old, but he wasn’t sure just how old. When he saw the announcement about PPL Electric Utilities’ Oldest Refrigerator Contest in his bill earlier this year, the Denver, Lancaster County, resident guessed he had a chance of winning. It turns out he was right. His 1938 General Electric model turned out to be the oldest recycled during the contest in the PPL Electric Utilities service territory in central and eastern Pennsylvania. As the winner, he’ll receive a $250 Sears gift card. The prize was on top of the recycling $35 incentive available to all PPL Electric Utilities customers who recycle their older refrigerators and freezers. Old iceboxes may look cool, but even models much younger than Ansel’s vintage General Electric run up electric bills when they’re kept running in out-of-the-way places like garages and basements. The second-oldest refrigerator recycled during the PPL Electric Utilities contest was a 1950s-era appliance from Weatherly, Carbon County. Older, inefficient refrigerators can cost up to an extra $150 a year to operate. Appliances picked up through the program are taken to a JACO Environmental facility in Hatfield, Montgomery County, where workers safely reclaim 95 percent of the materials for other beneficial uses, including the manufacture of new products. Even the foam insulation is safely incinerated to generate electricity. The PPL Electric Utilities contest was part of a larger, statewide contest coordinated by JACO, which also operates appliance recycling programs for most other electric utilities in Pennsylvania. PPL Electric Utilities customers can have their refrigerator conveniently recycled through the utility’s E-power® appliance recycling program by calling 1-877-270-3522, or visiting the utility's appliance recycling website. The program is limited to the removal of two units per household per calendar year. Refrigerators or freezers to be recycled must be in working order and between 10 and 30 cubic feet — standard size for most models. PPL Electric Utilities, a subsidiary of PPL Corporation, provides electricity delivery services to about 1.4 million customers in Pennsylvania and consistently ranks among the best companies for customer service in the United States. More information is available at www.pplelectric.com.